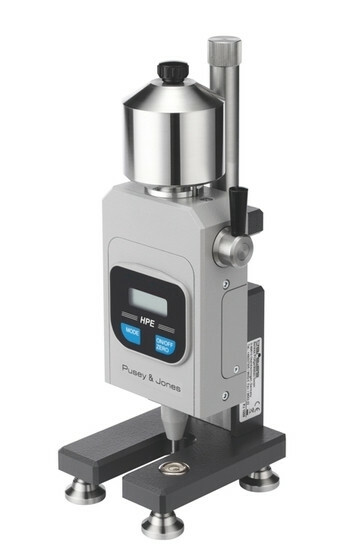 Our top quality Pusey & Jones (P&J) hardness tester (Plastometer) serves for the determination of the penetration depth on rubber and elastomer materials like rubber rollers and standard blocks made of rubber with a minimum thickness of 13 mm as well as paper rollers. The electronic dial gauge is integrated in the instrument and shows the indentation depth to an accuracy of 3 decimal places (0.000 mm). With the help of a vertical spindle which is integrated on the back of instrument, the dial gauge can be moved up and down conveniently and precisely. The dial gauge is equipped with a zero setting function. Zero can be set by a single press of the zeroing key as soon as the indenter, together with the measuring bar, is lifted about 3 mm by lowering the body of the instrument. The prescribed total load of 9,8 N is applied by lowering the loading lever on the right side. The test result can be read after a test time of 60 seconds. The basic equipment includes adjustable feet which can be adjusted according to the test object. With the help of precise and user-friendly design of our P&J hardness tester, users can perform an easy, quick and reproducible measurement under load.